Right of the bat, I will acknowledge that Blaze Pizza is not 100% gluten-free, and that cross contamination is definitely a real and present danger. However, after communicating my needs with the staff, they worked with me to make my pizza as safe as possible. I definitely recommend visiting on a non-peak hour (lunch or dinner) because it allowed the staff to follow and monitor my pizza from start to finish (a tip for dining out at any time). The gluten-free crust is free from soy, eggs, fish/shellfish, dairy, and nuts, and is made in house. Daiya vegan mozza is available for vegans, but I prefer my dairy-free pizzas sans vegan cheese. For the full allergen menu, click here. When I stepped up to order, the staff member asked me to clarify the degree of my gluten-free-ness (to which I said "allergy"), and I asked them to change gloves, use fresh tomato sauce and spreader (that hasn't been used w/ gluten-full pizzas), and a clean paddle and pizza cutter to handle my pizza. The dough press used to press the dough was not the primary one used for gluten doughs, though I didn't confirm that it was exclusively gluten-free. There is only one oven to fire pizza, but the pizza stays on a protective sheet to prevent cross contamination. As I went down the line, I topped my pizza with banana peppers, spinach, artichokes, mushrooms, sea salt, and oregano. I loved the wood fired flavor of the pizza, which created a charred crust and lovely flavor of the dough. The dough itself is thin (the pizza could have been cooked a little longer), but I liked that I could fold it New York style to prevent the toppings from pouring out. The crust is definitely above frozen or pre-made ones, which are often cracker-like. The sauce is vibrant and the veggies fresh, so I definitely left satisfied. 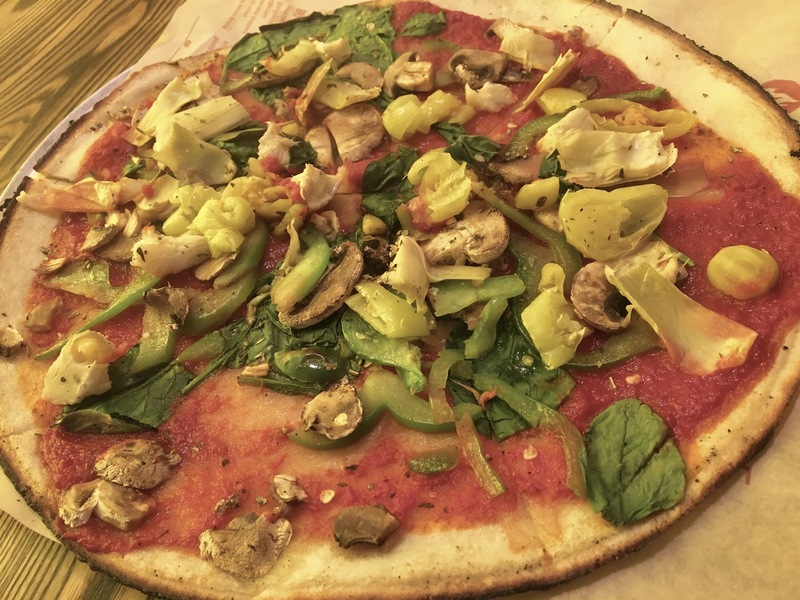 What makes or breaks Blaze Pizza is the gluten-free knowledge of the staff, which worked in my favor for this visit. However, I can see that my experience could have easily gone downhill had the staff been less understanding or willing to accommodate my concerns. With those cons noted, the pros of Blaze Pizza are definitely that it is affordable (less than $12 for 12" pizza) and fast casual, which means that you can get a solid pizza fast, perfect for lunch breaks or grabbing dinner on the go.